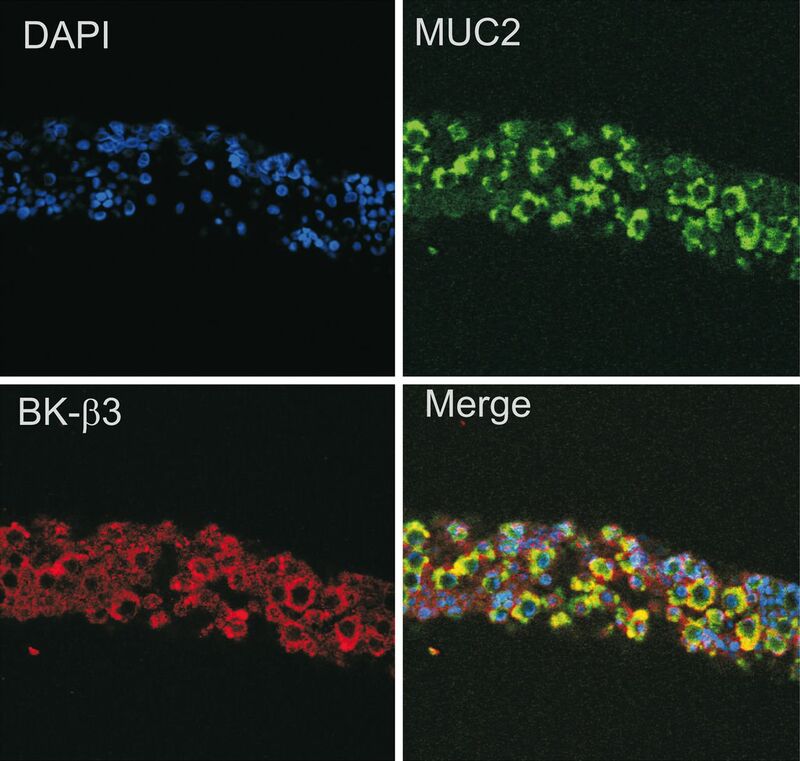 BK channel β3-subunit co-localizes with the goblet cell marker MUC2. Confocal images of the mid-third region of a single, isolated human colonic crypt. (Goblet cells were stained with MUC2 antibody with DAPI nuclear counterstain). The BK channel β3-subunit protein was localised to goblet cells. The merged image shows overlap of MUC2 antibody and BK channel β3-subunit antibody in the yellow areas. 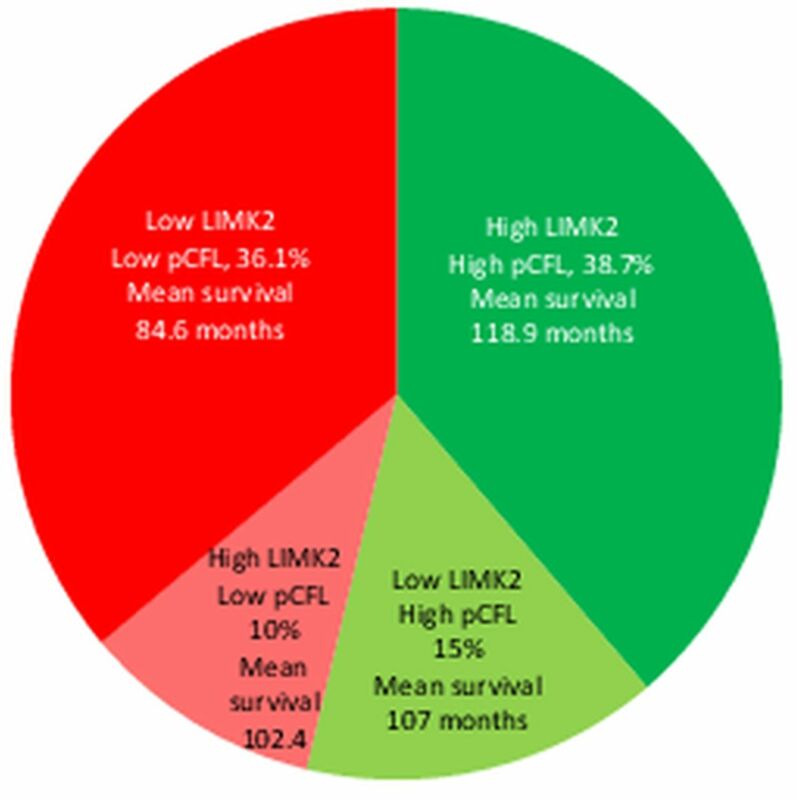 Association of LIMK2 expression and cofilin phosphorylation (pCFL) with patient outcomes. Distribution of outcomes for all combinations of High and Low LIMK2 and pCFL. Faecal immunochemical testing (FIT) is increasingly used in CRC screening but has a low sensitivity rate for detecting advanced neoplasia. In this study from the Netherlands, Stegeman et al explored the value of combining risk stratiﬁcation, based on established risk factors for advanced neoplasia, with the FIT result for allocating screenees to colonoscopy. They used data from the colonoscopy arm of a Dutch screening study which compared colonoscopy with CT colonography (n=1112) and where subjects had also completed a risk factor questionnaire and delivered a FIT. Smoking and positive family history of CRC were independently associated with a higher risk of advanced neoplasia/adenomas and were thus used for a clinical risk score in addition to positive FIT assessment in the same cohort. Adding risk based stratiﬁcation increases the accuracy of FIT-based CRC screening and could be used in pre-selection for colonoscopy in CRC screening programmes. Is it time to resect and discard small colonic polyps? The adenoma detection rate is considered a key parameter of competent colonoscopy. Inevitably, more polyps, especially smaller ones, are being detected. The histologic analysis of these polyps is costly, so endoscopists have been thinking about resecting all polyps and discarding the small ones (mostly <5 mm, some also think <1 cm). Follow-up intervals (10 years for small hyperplastic and 5 years for small adenomatous polyps) would then be determined by the endoscopic features and differential diagnosis between these two entities. This has been called the DISCARD strategy. In this issue of Gut, Schachschal et al report on a large German private practice based screening study that prospectively assessed whether the high accuracy for endoscopic polyp diagnosis as reported by reference centres can be reproduced in routine screening colonoscopy. They show that accuracy rates of endoscopic polyp differentiation are still insufficient for daily routine. Better training and perhaps also endoscope and image capture technology may help in the future, but this would have to be shown in well-designed studies. 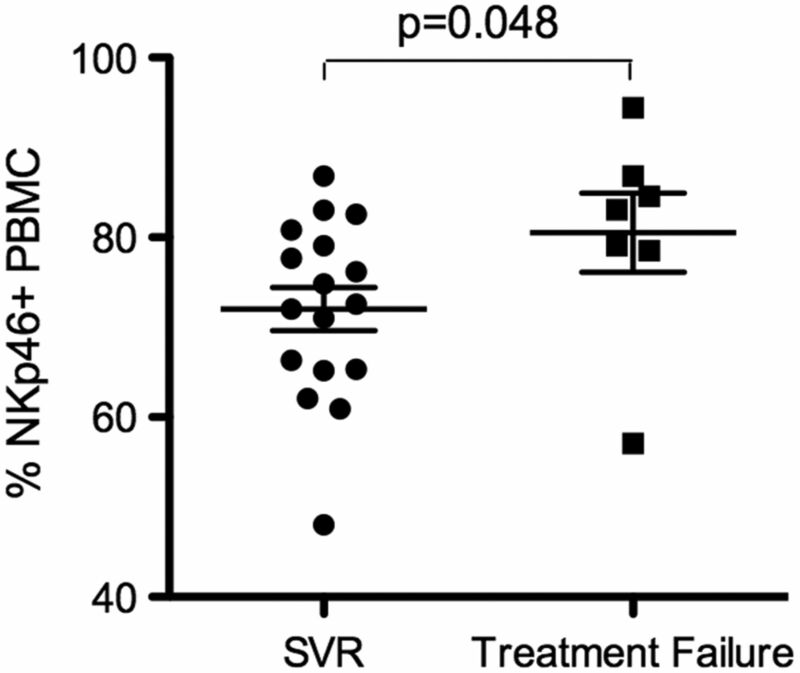 Patients clearing HCV upon Interferon treatment (SVR) exhibit lower expression of NKp46 before treatment than patients failing treatment. Patients with HCV/HBV dual infection have a two- to three-fold higher risk of developing hepatocellular carcinoma (HCC) than patients with either infection alone. Response rates to combined antiviral treatment are similar in dual infected and in HCV only infected patients. This retrospective study from Taiwan (see page 506) with an impressive number of patients shows that antiviral treatment reduces HCC incidence, liver-related and overall mortality in dually infected patients. Therefore treatment is strongly suggested despite increased incidence of side effects. See also commentary on this paper.